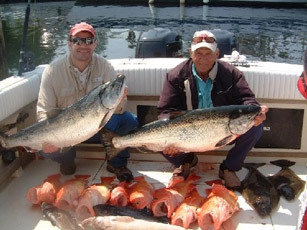 Port Hardy on Vancouver Island possesses some of the best fishing that the British Columbia coast has to offer for Calgary executives. 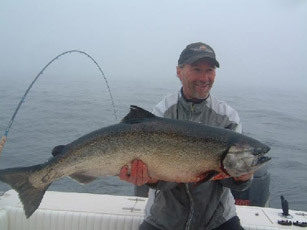 Abundant migratory and local stocks of salmon, halibut, or bottom fish with miles of unspoiled wilderness guarantee a world class fishing experience. 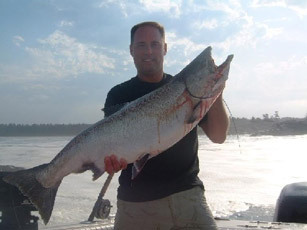 Calgary come and visit beautiful Vancouver Island for an amazing fishing Charter. Our package price include processing your catch for travel, so we don't waste your time cleaning fish at the dock. 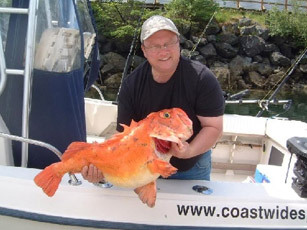 We arrange for the processing of your fish while you relax or explore Port Hardy. Glen Lyon Inn & Suites: This modern, newly expanded and furnished Oceanfront hotel gives you guaranteed spectacular views, since all rooms and suites face Hardy Bay. During spawning season, you can see the fish jumping from your balcony. The hotel is adjacent to the marina and near Port Hardy's town center, bus and B.C. Ferries terminal. Quarterdeck Inn & Marina Resort: Stay here and enjoy one of 40 deluxe oceanview rooms and suites,a complimentary continental breakfast, hot tub and I.V. 's Quarterdeck Pub, all of which overlook Port Hardy's inner harbour. You are minutes from B.C. Ferries terminal. No matter which accommodation option you choose, we provide dinner for you at your choice of Port Hardy's fine restaurants. Everything is included in your fishing charter package. *The above package includes custom processing and vacuum packaging. Your catch will also be boxed for transport. **The above package includes custom processing and vacuum packaging. Your catch will also be boxed for transport. *All packages subject to applicable tax. Waterfront accommodations at one of our chosen Hotels. All meals, including dinners and on-board lunches. Guided, fully equipped 25’ Grady White Sport fishing vessels. Private bathrooms aboard all the boats. Rain Gear provided (if needed). All Vessels and Guides are fully Transport Canada Certified. All Custom processing and packaging of all your catch. Free Shuttle from Port Hardy Airport to hotel and return. A $800 CDN deposit is required to reserve your requested date(s). The remainder is due upon arrival in Port Hardy. A refund will be issued if the trip is cancelled more than 8 weeks before departure. All payments are non-refundable, however, payments are transferable to either alternate available dates or to another new guest of your choice. Please contact us for more info on larger group packages, corporate packages, and any other requirements or special requests you may have to build your perfect vacation charter fishing adventure. Note: alcohol is not included in any of the packages. An extra night's accommodation is $50/person. Fuel Surcharge of $75/boat per day may be added if fuel prices exceed $1.30/L. We understand that sometimes things happen which make missing your trip unavoidable. Our policy is that you will receive a full refund on charter booking deposits if the trip is cancelled providing us with at least 60 days notice. Without a 60 day notice, your booking deposit will be retained unless we are able to successfully re-book another customer on your booking dates. If you plan to return the following year, your deposit will be held on account till the following season, thus you will not lose a deposit if you re-book for or we successfully find customers to fill your dates that have been cancelled. All deposits for future reservations must be received prior to January 1st to hold the dates you have booked. Deposit amounts vary depending on the package booked and custom packages etc. All balances owing are due upon arrival or prior.